Christmas is the most colorful and joyful holiday of the year. It’s a time spent with those you love, your family and friends, a time of contemplation and peace. But Christmas is also the time to thank the people around you with little presents and make their days worthwhile. Christmas Eve is not quite there yet, however, but that doesn’t mean that you can’t find some tranquility in preparations! 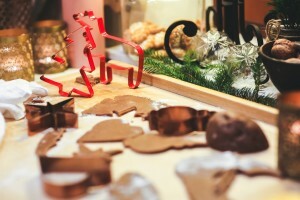 Wrap your presents, do your Christmas shopping in time, and start baking Christmas cookies! 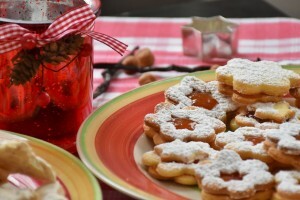 Baking is a nice and calming task, even though you do have to pay some attention to the right timing and the oven clock. And it’s best done in company! Grab your children or siblings or invite your best friend over and bring out the baking supplies! For this task, we have some nice background sounds that will not disturb your concentration, interrupt your conversations or adds to the radio or music playing just wonderfully. What are the sounds you typically associate with Christmas? The ringing of tiny sleigh bells? The happy chatter of a family gathering? You can either play an atmosphere with a Christmas tune from your laptop or mobile app or use the sounds of sleigh bells and soft wind to turn the music of your favorite CD into a festive soundtrack for your Christmas baking session. Just play the mix you like in the background. Finally, the Christmas shopping is done! You come home from a stressful shopping trip where you got the last presents and ingredients. But now, you have to start baking. Don’t let the stress of the outside world affect your holiday spirit. Pour yourself a cup of hot chocolate — because we all know that chocolate can make you happy — and slip into comfortable clothes. Now, all you have to do is turn on some relaxing music and the baking chores will become a laid-back and calm activity. To many people, the sound of rain has a relaxing effect. The same is true for the crackling of a fire that can make you feel all homely. Add the purring of a cat and you have the perfect mix of a relaxing atmosphere. Not everyone has an open fireplace at home and the weather is not always in your favor. Maybe you are also not allowed to have a cat, or you are allergic to them? All of this should not keep you from enjoying a rainy atmosphere! Browse Ambient-Mixer.com or use the search function with terms like cats, rain, fireplace, purring, storm or anything else you may find relaxing!